Lightbox, 2,95 x 11,80 meter. Wood, inkjet print on Photopaper, TV monitors, DVD loops. Wineke Gartz created two collages combining documents from Witte de With’s archive, images of her own work, and other sourced material. As such she transforms the archive into an image stream rather than an organized system. Auras and dissolves, transparencies and layering all add up to dreamlike and haunting images. Through a process of digitizing print collages spread out on her studio floor, Gartz dealt with the specificities of the digital and its impact on imagery. 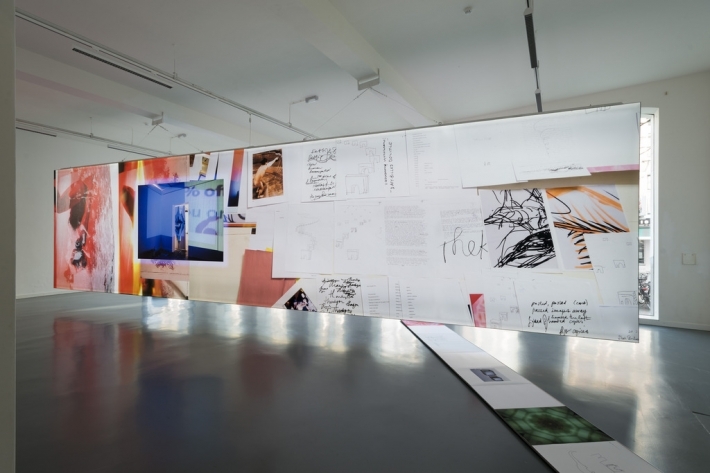 Her work, much like Witte de With’s own archival history, evolved along the increasing opposition and dynamic between the hard copy and the digital. The street side of the light box is eclectic and offers an overload of imagery, in line with the busy street it looks out on. 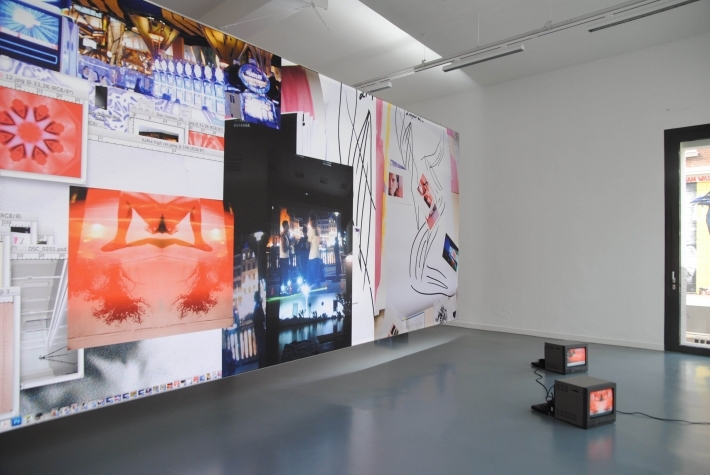 Here Gartz uses mostly photographs she took while installing her previous video installations, and which now create portals, doorways or escape routes from the feverish process of creation. 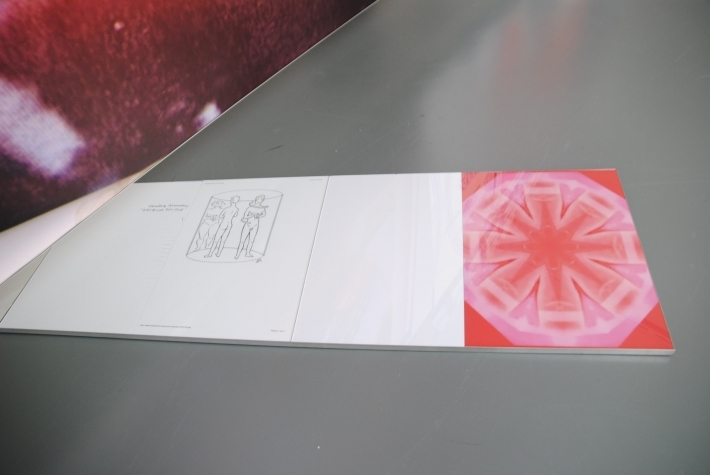 The centrally placed video-still is taken from the recording of the performance Red Light, Poses (2009) and shows Gartz’s body by use of a video effect, turn into a surreal animal like object, bathing in red and gold light. The casino slot machines seen on the upper half of the image illustrate the artist’s fascination with America, its consumer culture and commodified notion of happiness, a fascination she shares with Dan Graham, who is a long time conversation partner of Gartz’s. Graham is also present is this work through a reproduced still from his iconic video essay Rock My Religion (1982–1984), and from his performance Body Press (1972), in which we see him holding a camera. A softer approach is seen on the other side of the light box, where archival letters and drawings by artist Paul Thek (1933-1988) are presented alongside lists and drawings by Gartz herself. She strongly relates to Thek’s practice, which she sees as a form of exorcism, dealing with the labyrinths of spirituality, sexuality and technological progress. 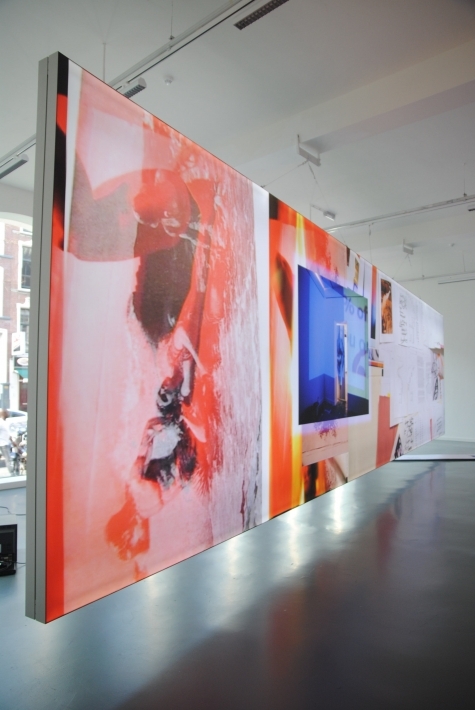 These documents fade over into a collage of images mainly taken from Gartz’s body of work American Pain (2009-ongoing), parts of which are also on view on the monitors in the space.